The Thule Sleek is a new convertible stroller that transforms from single into a double mode. It can handle twins or siblings close in age. You can buy it as a single model and than later on add the second seat or even a stroller board for an older child. With 14 different seating arrangements, it grows with your family. It can handle two toddler seats, two bassinets, or two car seats. Both seats are reversible and have a deep recline. This model is very similar to the popular UPPAbaby Vista. Since Sleek is still not out, I can’t tell you if it’s better than Vista. From what I’ve seen at the ABC Kids Expo where this model was first presented, it doesn’t have anything that makes it stand out except for the modern design and a lighter weight of 24 lbs which is a few pounds lighter than most convertible strollers. Just like Vista it features large canopy, adjustable leg rest, swing-away bumper bar, adjustable handle bar, large basket, all-terrain wheels, all-wheel suspension and flip-flop-friendly brake. Let’s talk about price a little bit. The Sleek will be retailing for $849 which is not cheap and it comes without bassinet. The Vista on another hand retails for $899 and comes with a bassinet. Vista bassinet is high quality and can also be used as an additional sleeping place for your baby. Big plus! The handle bar and bumper bar on Vista is covered with nice leather vs Sleek that has rubber bumper bar and foam handle bar. So far for me, Vista wins. The only thing that Sleek has going for it is lighter weight. In single mode Vista weighs 26 lbs vs Sleek that weighs 24 lbs. Do you guys agree with me? Am I not seeing something? This baby will retail for around $849 and come in five colors. Sorry, I don’t have any good photos yet. -Great canopy. The canopy has two large panels with another zipped-in mesh panel that provide plenty of coverage. The mesh panel provides nice ventilation and can be covered on a chilly day. There is also a small pop-out sunvisor and a plastic peekaboo window with a magnetic closure. Love magnetic closures instead of noisy Velcro that can wake your baby up. -Adjustable handle bar. The telescoping handle bar goes from 38″ up to 45″ from the ground giving parents 8″ range. Perfect for shorter and especially taller parents who might need more leg room. The handle bar is covered with foam which I have love/hate relationship with. On one hand I love that it’s so comfy to the touch, but on the other hand it’s harder to clean than rubber and it also absorbs the sweat. -Reversible seat. The main seat has one-hand lever recline with three positions. It does keep that ‘v’ shape when reclined. You can convert Sleek into a double stroller by adding a second seat. The main seat has weight capacity of 48.5 lbs while the second seat can handle up to 33 lbs. The stroller can take two seats, two car seats or two bassinets. With 14 different combinations it can easily accommodate twins or siblings close in age. All the seat materials are removable and machine washable. They are non-toxic. -5-point harness. It has an adjustable padded 5-point harness with two small release buttons in the buckle. The buckle is hard to open for a toddler, but easy for parents. To open the buckle all you need to do is push two middle buttons while squeezing the sides. No escaping from this seat! -Adjustable leg rest. The leg rest is adjustable and has three positions. There is also another leg rest that is part of the frame that kids can use to climb into the seat. -Large basket. The basket not only big, but also has a zipper cover which prevents stuff from falling out. If you don’t need it, you can simply roll the cover away. And the cool thing is that the back panel expends and closes with magnets so you really don’t need to unzip the cover to access your stuff. It has a weight capacity of 11 lbs. There is also a small zipper pocket in the back of the basket for small essentials. -Flip-flop-friendly brake. There is a one-step break in the back that locks both of the rear wheels. This brake is flip-flop-friendly. -Large wheels. It rolls on foam-filled tires with 12″ tire in the back and 8″ in the front. The front wheel is swivel, but can be locked straight. -All-wheel suspension. Makes the ride much smoother absorbing the bumps. -Easy fold. The fold is easy but bulky. You can fold it with the seat attached. It will take a lot of room in your trunk. To make it more compact you could remove the rear wheels. -Upper adapters. INCLUDED! If you want to turn your stroller into a double mode, you would use those adapters to create more room between the seats. Now, the cool thing about those adapters is that you can use them without the second seat to position the seat higher on the frame. Bringing your baby closer to you promotes better parent-child bonding. This is one of the biggest features on strollers like Stokke Xplory where the seat is higher on the frame. Many parents would buy unpractical Xplory just because of that. I love this option. -Travel system option. 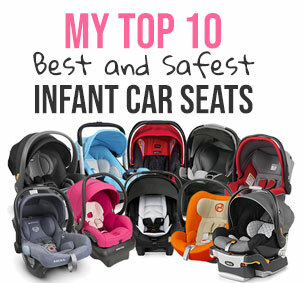 It works with major car seats like Nuna, Chicco, Graco, Cybex and etc. -Bassinet option. The bassinet is not included, but could be purchased separately. -Bulky. Like most convertible strollers Sleek is bulky when folded. -High price. This is stroller is not cheap and it does not come with a bassinet. For that price I think that the bassinet should be included. Thule offers a limited lifetime warranty on the stroller. Here is more information on the warranty. The Thule Urban Glide is available in five colors: Grey Melange, Midnight Black, Shadow Grey, Navy Blue, and Energy Red. This baby will retail for around $849 and come in five colors.